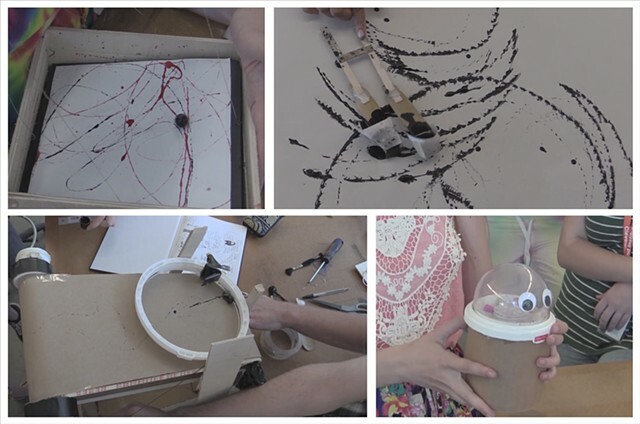 For this project, which is given on to Freshman students on the first day of the school year, students are tasked with designing and creating a drawing machine. The goal of the drawing machine is for it to have at least one moving part that can be controlled by the hand, but is not an extension of it. At this point in the semester students have limited access to wood shops or other fabrication facilities, so the outcomes tend to utilize more experimental materials, constructions, and other solutions. Once complete, the drawing machines are then used to create a series of collages for project 2.